Will Electric Highways Lift Sales Of Electric Vehicles? The thought of owning an electric car is a dream for many people, and those who are thinking of taking the plunge may be realizing the inability to drive long distances without recharging a number of times. It’s called “range anxiety,” the fear of driving too far and running out of juice. 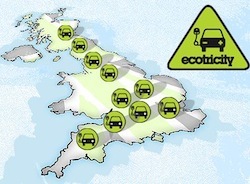 If you wouldn’t mind owning an electric vehicle but want to wait until you can drive it long distances, Ecotricity has your back, if you are in Britain. They are installing an array of charging stations up and down Britain, so you will be able to pull over and give your electric car a charge once the juice is running low. The reason this hasn’t been done sooner is because of the lack of demand. With only a few thousand electric cars on the road, there isn’t much of a need for charging stations. However, many people are hesitant to buy an electric car due to the difficulty involved in charging it when driving long distances. It’s a bit of a catch-22, and this is the first step in putting a halt to the circle that is preventing the sales of electric vehicles. This isn’t just happening in Britain. Walgreens is taking the plunge in the United States, with 800 charging stations expected to go up across the country. Best Buy, Cracker Barrel and Lowe’s are just some of the other retailers looking into this idea. This could be a next step for many businesses as far as improved sales. If an electric car driver needs to pick up groceries or run some errands, they may be more likely to head to a store that will let them charge up while they are there. Will these charging stations affect your stance on electric vehicles? Are you more likely to purchase an upcoming Ford Focus EV or another electric car if charging stations are readily available at an affordable cost, or even free?